At Lime we have a mission to democratize wireless networks and to bring disruptive technology to the cellular market which will enable the service providers to deploy, maintain and upgrade their network at a fraction of today’s cost. Lime manufactures advanced RF integrated circuits called FPRFs (Field Programmable RF), also known as Software Defined Radios, which are fully programmable dual transceivers. Our chips cover all the cellular channels used globally, which makes them ideal for applications such as radio access for cellular and IoT. Radio access networks (RAN) include equipment from residential boxes through to systems used in shopping malls, sports stadiums and wide area networks. Many of the RANs on offer today are produced by major communications equipment vendors who supply the Mobile Network Operators (MNOs) with a full suite of products. They sell the hardware alongside proprietary software stacks running on the hardware itself and its management system. Both large and small MNOs are working to radically change the situation in the same way they have done for other parts of their networking infrastructure with clear impacts on their business models. Their target is open systems that are scalable and which let them offer exciting new services in a fraction of the time and cost it takes today. Going forward, the radio access network will be based on Network Function Virtualization and Software Defined Networking (NFV/SDN). For that the MNOs need open source hardware (white boxes), to work alongside the software to gain full advantage. This is where we at Lime are enabling novel solutions for white boxes and more crucially making it available to everyone. FPRFs are open source boards and modules that offer powerful capabilities, but require skilled RF designers, which are in short supply. So in 2016 we ran a highly successful crowdfunding campaign, attracting over 4000 supporters- from hobbyists to major operators. This produced software defined radio (SDR) boards that can be simply plugged into a PC to provide cellular wireless connectivity. The resulting product, LimeNET, can be configured by software engineers without any in-depth knowledge in the field of RF. By gaining access to such technology, the open source community has put a significant effort behind creating and optimizing the radio board in our solution. The SDR can be enabled by simply downloading an application and the community is now busy creating apps for the LimeSDR and associated processor. We call this an “app enabled” network, and we are collaborating with Canonical to create an app store of both free and paid applications. There is already an open source Ubuntu-based app available for GSM and a highly advanced LTE implementation together with evolved packet Core technology. Both are at an advanced stage and will be provided in our app store once our second campaign reaches its target and we’ll start delivering the products to our backers. 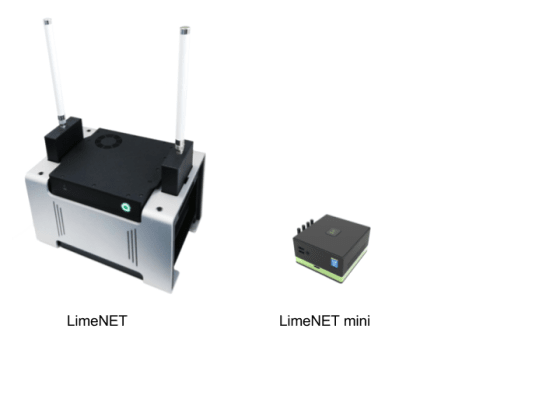 This crowdfunding campaign is for Lime and Ubuntu to integrate the LimeSDR board into a self-contained Network in a Box. The plan is to produce two designs which will be called LimeNET and LimeNET Mini. Both feature the LimeSDR, together with memory and a processor, but the more capable LimeNET is equipped with more memory and a higher spec processor with a PCIe version of the LimeSDR for higher bandwidth. These designs will provide a platform for software developers to create Linux-based apps for cellular and IoT networks and associated applications. These two versions are aimed at different applications. The Mini is targeted at the lowest cost and is well suited for developing applications for small office/home office (SOHO) or IoT use. The coverage is limited by the output power of the radio, giving around 10 to 15 meters range for a high bandwidth LTE link. There will be a Power Amplifier module offered later in the year for applications needing an extended range. In contrast, the higher transmit power (10W) and compute power of the LimeNET makes it a candidate for more heavy duty work. For example, if it is installed in a factory complex it would provide campus wide coverage. The technology allows several LimeNET units to form a mesh, where each can communicate with a near neighbor. This scenario is particularly relevant in situations where not every site has access to the internet, as units can pass traffic along to a unit which is internet enabled. This capability can make a dramatic difference to the total installation cost. MNOs will benefit from LimeNET in several ways, because its radio technology is open source and doesn’t carry the baggage of expensive and inflexible proprietary software. It fits into a scalable NFV/SDR network and allows configuration in real time to meet the current demand. The SOHO and IoT markets can be serviced by the Mini hardware with a simple download to configure the box and set the channels. LimeNET boxes can also offer cost-effective solutions as “in-fills” where the Macro signal is weak or they can be located at local hot spots to ease the burden on the wireless network. LimeNET designs are fully in line with the industry push toward an open NFV/SDN architecture. This has not escaped the notice of MNOs and we have already had significant interest from operators, including the largest 4G provider in the UK. Most MNOs are obliged to meet a minimum coverage of either population or area, but in remote or difficult locations the low revenue cannot justify the expense of providing a Macro base station. So they look to LimeNET to meet their contractual commitments at an economic cost. I believe that white boxes will open up new business opportunities for the MNOs. They license very expensive spectrum and can now exploit this with novel business models like “Spectrum-as-a-Service” (SaaS). Here the LimeNet equipment would use the licensed bands of the MNO, and an enterprise customer would provide high performance and customised solutions for its mobile workforce. The concept supports employees who want to use their own devices for work, the so-called BYOD people. Clearly, this incentivizes the enterprise customer to remain loyal to the MNO and not churn to a competitor, and also encourages the employees to sign up with the MNO. The open source LimeSDR means people are free to use the design either “as is” or to modify it. Engineers know that although they might modify the physical design, the underlying hardware and Operating System remain unchanged. Designers can incorporate the LimeNET into their own equipment and don’t need to be RF specialists, or they can modify the software to change the functionality. This opens up the possibility of adding a small cell or IoT capability to an endless number of machines, such as a server blade equipped with the LimeNET or adding small cell and IoT connectivity to a vending machine. This dual-use addresses issues such as Permit and Zoning headaches that have dragged on the wider deployment of small cells. Based on Ubuntu Core, LimeNET offers developers the best development environment for developing SDN and NFV application. The LimeNET appstore also gives developers a way to monetise their applications across all deployed limeNET RAN. Working with Canonical it also means companies, going to production with limeNET have a commercial partner for support from solution creation to deployment. LimeSDR is also supported by SoapySDR, which is a vendor neutral open source generalized C/C++ API. This programming environment allows software engineers to personalize the board for parameters such as the frequency bands and bandwidth. The hardware is fully open source with, for example, every register in the FPRF fully documented. I am very excited that LimeNET opens up the market to numerous new vendors who can exploit the low cost of ownership to bring true innovation into the marketplace. Our new crowdfunding campaign is due to start soon, you can register your interest to get up to date progress reports and the hardware will be built by the proven original design manufacturer (ODM) who successfully built the LimeSDR boards. By registering you will also receive details of projected prices and availability upon the campaign’s launch, later this month.